Hamilton is the capital of the British Overseas Territory of Bermuda. It is the territory's financial centre and a major port and tourist destination. Its population of 1,010 (2010) is one of the smallest of any capital cities. The history of Hamilton as a British city began in 1790 when the Bermuda Government set aside 145 acres (59 ha) for its future seat, and was officially incorporated in 1793 by an Act of Parliament and named for Governor Henry Hamilton. The Colony's capital relocated to Hamilton from St. George's in 1815. The City has been at the political and military heart of Bermuda ever since. Government buildings include the parliament, Government House to the north, the former Admiralty House of the Royal Navy to the west (both in Pembroke), and the British Army garrison headquarters at Prospect Camp to its east. The Town of Hamilton became a City in 1897, ahead of the consecration in 1911 of the Cathedral of the Most Holy Trinity (Church of England), which was under construction at the time. A Catholic cathedral, St. Theresa's, was later constructed. Today, the city overlooking Hamilton Harbour is primarily a business district, with few structures other than office buildings and shops. The City of Hamilton has long maintained a building height and view limit, which states that no buildings may obscure the Cathedral. In the 21st century, buildings have been planned and some are under construction that are as high as 10 stories in this area. Bermuda's local newspaper, The Royal Gazette, reports "If you don't recognise the city, from 15 years ago, we don't blame you as it has changed so much". Hamilton is located on the north side of Hamilton Harbour, and is Bermuda's main port. Although there is a parish of the same name, the city of Hamilton is in the parish of Pembroke. The City is named after Sir Henry Hamilton, governor from 1786 to 1793. Hamilton Parish pre-dates the city. 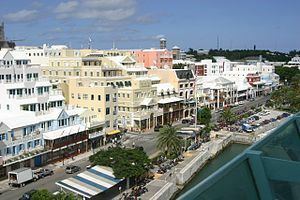 The administrative capital of Bermuda, Hamilton has a limited permanent population of approximately 1,010 (2010); however, 13,340 (40% of Bermuda's population) work here on a daily basis. The only incorporated city in Bermuda, Hamilton is smaller than the historic town of St. George's. A more representative measure of Bermuda local residential populations tends to be by parish. As the offshore domicile of many foreign companies, Bermuda has a highly developed international business economy; it is an exporter of financial services, primarily insurance, reinsurance, investment funds and special purpose vehicles. 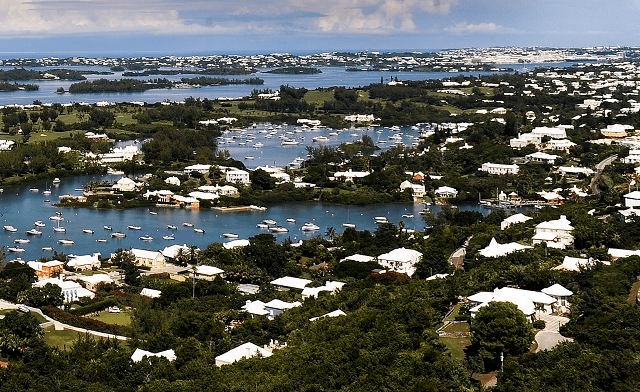 Finance and international business constitute the largest sector of Bermuda's economy, and virtually all of this business takes place within the borders of Hamilton. Numerous leading international insurance companies are based in Hamilton, as it is a global reinsurance centre. Around 400 internationally owned and operated businesses are physically based in Bermuda, and many are represented by the Association of Bermuda International Companies (ABIC). In total, over 1,500 exempted or international companies are currently registered with the Registrar of Companies in Bermuda. The city is the registered headquarters of the spirits manufacturer Bacardi, outsourcing company Genpact, telecommunications company Global Crossing and reinsurance company Tokio Millennium Re Ltd. Hamilton is known as the headquarters of international shipping companies, such as DryShips Inc, Frontline Ltd. and Dockwise. Its low corporate tax rate makes it attractive to US companies. In addition, the corporate headquarters of the Bermuda grocery store chain The MarketPlace is located within the chain's Hamilton MarketPlace location, the largest grocery store in Bermuda. The coat of arms of the city of Hamilton incorporate a shield featuring a golden sailing ship, representing the Resolution, surrounded by three cinquefoils, two above the ship and one below, also in gold, all on a plain blue background. This shield is supported by a mermaid and heraldic sea horse (i.e., demi-horse, demi-fish), and is placed on a mount in front of which is a scroll containing the motto "Sparsa Collegit". The shield is topped by a crest featuring a closed helm topped with a torque above which an heraldic seahorse is emerging from the sea holding a flower. The city's full motto is Hamilton sparsa collegit, ("Hamilton has assembled the scattered"). The city's flag is a banner of arms, featuring the same details as on the shield of the city's coat of arms, but with the flowers in white rather than gold. The city of Hamilton has many parks for its size. Probably the most notable park in the city is Victoria Park. This park occupies a whole block and was named after the former Queen Victoria. Other parks in the city are Par La Ville Park, Barr's Park, All Buoy's Point Park, and the hidden Cedar Park. Although north of the geographic tropics, Hamilton has a warm, humid subtropical climate that falls just short of being a true tropical climate. It is warm enough for coconut palms and other tropical palms to grow, although they may not fruit properly due to the lack of heat or sunshine during the winter months because of latitude. Hamilton has uncharacteristically warm temperatures for its latitude (32°N) because of the moderating influence of the North Atlantic and nearby Gulf Stream. Hamilton features warm and humid summers and very mild "winters". As temperatures are moderated by the Atlantic Ocean, it rarely gets very hot or cold in the city. Precipitation is plentiful throughout the year and Hamilton does not have a dry season month, a month where on average less than 60 mm (2.36 in) of precipitation falls. Summer precipitation is usually from showers, thunderstorms, and tropical disturbances or even tropical cyclones. Meanwhile, winter precipitation is typically derived from westerly moving extra-tropical cyclones and their associated fronts. Erratic, extended dry spells occasionally develop because of variations in the semi-permanent sub-tropical ridge locally known as the Bermuda-Azores High. Hamilton has a host of beaches, which provide many opportunities for water sports, including surfing, wind surfing, water skiing, jet skiing, sailing and diving. The highlight of the sports calendar is the Bermuda Gold Cup (or Argo Group Gold Cup as it is currently known), a sailing event which is a key stage of the World Match Racing Tour, one of only three sailing championships to be sanctioned by the International Sailing Federation (ISAF) with 'Special Event' status. The Argo Cup brings the world's best match-racing sailors (including world champions and Olympic sailors) to Bermuda for 5 days of one-on-one 'match racing'. Points accrued during the event contribute to the World Match Racing Tour and ultimately a chance to race in the final event, the Monsoon Cup in Malaysia. The winner of that is crowned ISAF World Match Racing Champion. Unlike many water-based sports, which occur to far out to view from shore, 'match racing' is a great spectator sport. The race takes place only 15m from the shore, and spectators can see the heart of the action. The history of the modern Bermuda Gold Cup event dates back to the very beginning of the match racing style of sailing. The first 'match race' in a one-design racing yacht i.e. technically identical boats, was the King Edward VII Gold Cup in Bermuda (now known as the Argo Gold Cup), that was first sailed in 1937. The Argo Gold Cup is still a key event in the World Match Racing Tour calendar. The King Edward VII Cup itself was originally given at the Tri-Centenary Regatta at Jamestown, Virginia, in 1907 by King Edward VII in commemoration of the 300th Anniversary of the first permanent settlement in America. C. Sherman Hoyt won that regatta and was the first sailor to accept the historic trophy. Hoyt held the Gold Cup for three decades before donating it to the Royal Bermuda Yacht Club and proposing an annual one-on-one match-race series in 6-Meter yachts. In his letter he expressed the propriety of "my returning a British Royal trophy to the custody of your club, with its long record of clean sportsmanship and keenly contested races between your Bermuda yachts and ours of Long Island Sound, and elsewhere..." The first winner of the Cup in its new format was Briggs Cunningham in 1937. He was also the first skipper to win the America's Cup in a 12-Meter racing yacht. All but one route (Route 6) in Bermuda start from the bus terminal in Hamilton.